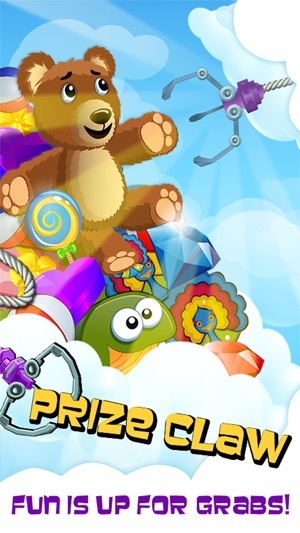 Welcome to Prize Claw, from the makers of the smash-hit free casual game Coin Dozer! For years, you've been going to the arcade, carnival, or theme park, trading cash for the chance to grab toys and candy with a motorized claw. Claw games are filled with tense moments of maneuvering the crane into place, wondering if you’re lucky enough to get that toy, coupled with the triumph of your prize dropping through the slot! 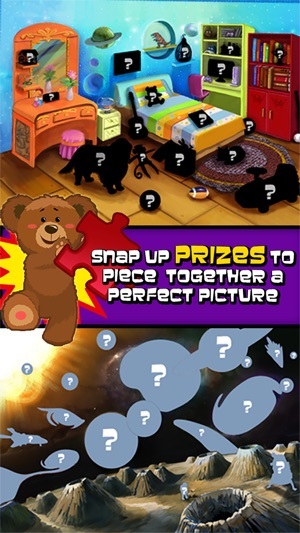 Prize Claw recreates that happy experience for women and men of all ages – no trip to the casino to play the slots needed – on your iPhone while adding many exciting new features! 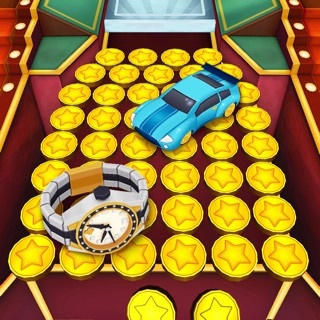 Step up to the machine and maneuver the claw to grab coins, gems, a stuffed animal, cars, dolls, and much more! 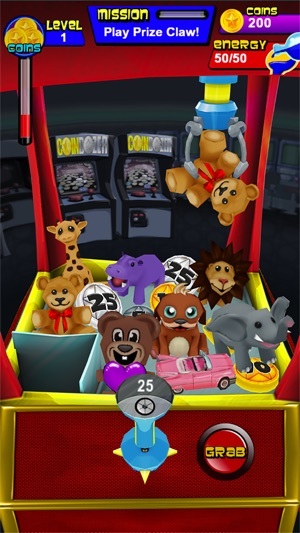 This game is much more than the standard grabbing you get from arcade crane machines, however: Prize Claw is filled with all sorts of unique items, powerful effects and challenging missions. Special gems grant an effect to enhance your collection power, and you can trade the prizes you collect for extra special bonuses. Prizes aren't the only thing you can trade in: the coins you collect can be spent to upgrade your claw, activate new powers, and even customize your machine! If you run out of grabs, don't fret! It won't take long before you receive more. Keep checking back to complete your collection, increase your skill with the grabber, reach a higher level, and unlock more stuff! • More than 60 prizes to collect – toy cars, a stuffed mouse, and much more! • Multiple machines to play on with different prizes, powers and looks! • A special puzzle to complete for each machine! • New 3D graphics with customizable machines, claws, and joysticks! • Simple to play, but with tons of challenging missions to earn a bonus prize! 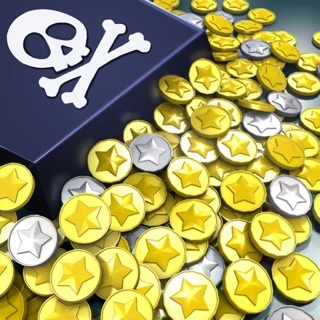 • Earn extra bonuses for playing every day! • Huge variety of bonuses and effects! Prize Claw is also available on the iPad! 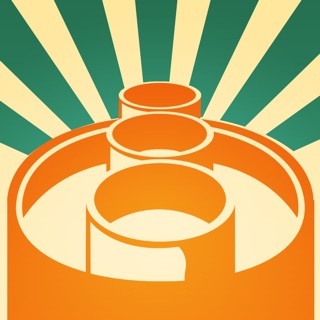 Also try out the other Game Circus titles like COIN DOZER and PAPLINKO! Resolved several visual issues within the game. Resolved an issue with Prize lines not rewarding the proper reward. The best claw game I’ve played! I’ve tried so many others, but nothing compares even remotely. It’s frustrating when you run out of grabs just when you’re about to get that last item for your mission, but isn’t that just like running out of quarters at the real machine? 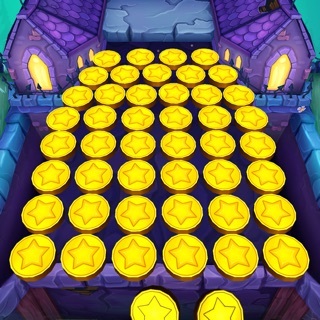 This game gives you the thrills and frustrations of those claw machines without costing you the money! Love this app! I'd give it 5 stars, but nothing's perfect. It's a great game to play when I have a few minutes to relax and unwind. I feel like kid playing a game and winning a prize every time. I don't like when I run out of grabs and have to wait what seems like forever to build them up again, but since my time to play is also limited, it works out fine and keeps me from from taking too long a break at work. Fake Apple detected a virus pop up!! Just like y'alls game coin dozer I also had to delete this game because of the Apple Virus Detected pop up! I've been playing both games off and on for years now. Just downloaded both of them again and they both had the fake scam virus pop up!! I'm not even sure if that was apart of y'all advertisers since on this game it popped up before I could even start playing it!! Had to delete the game and clear my history! People this is not something Apple sends out so DON'T click on it no telling what it will do to your phone!! 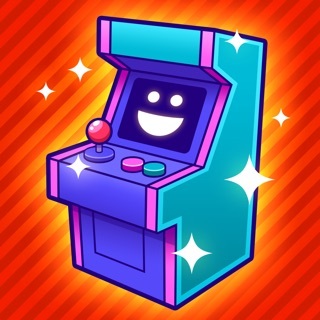 Pocket Arcade - Coins, Claw, Basketball & more!